Westmead Hospital staff during Emergo Train. 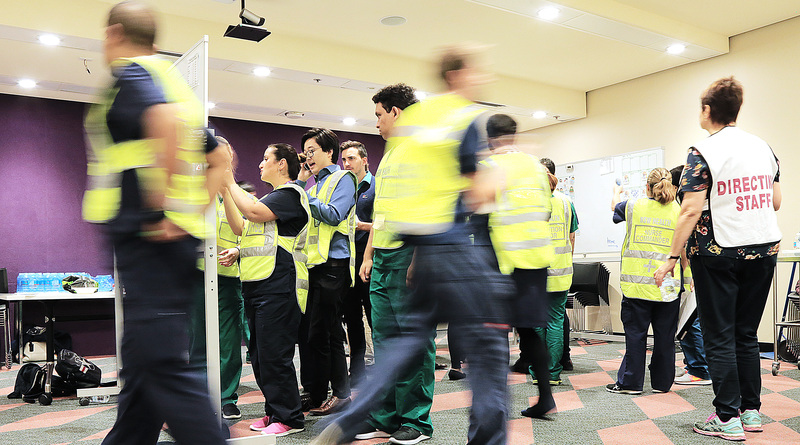 Westmead Hospital tested its capacity to respond to a major emergency on May 16, with 130 staff taking part in a hospital-wide simulation exercise, known as Emergo Train. In the simulation, a bus had crashed at Sydney Olympic Park after its driver experienced a cardiac arrest. Westmead Hospital and The Children’s Hospital at Westmead staff were called on to treat 148 patients. Emergo Train is an internationally-recognised, interactive simulation system developed in the mid-1980s. It creates real-life conditions, with staff put through their paces in real time. Disaster patients (represented by small cardboard cut-outs, complete with name, age and condition) are gradually fed into the exercise. Westmead Hospital ICPMR technical officers Gizem Dogru and Katrina Milczarek participate in Emergo Train. Western Sydney Local Health District’s disaster manager Caren Friend dubbed this year’s exercise a success. “Exercises such as this not only demonstrate our capability, but bring the team together to look for improvements for patient outcomes,” she said. The Emergo Train Exercise takes place at Westmead Hospital every three to five years.